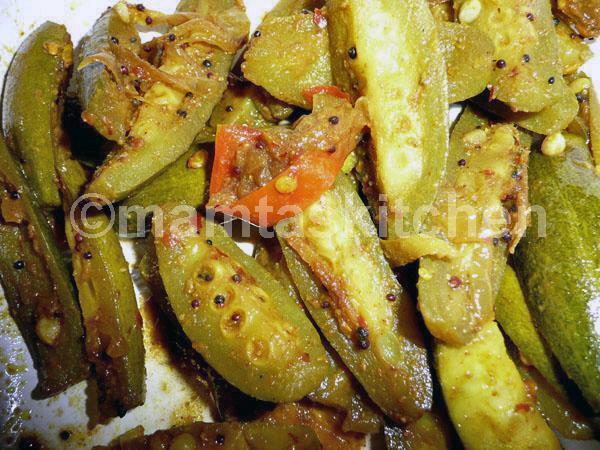 Also known as Parval, Parwal or Patola, this is a Small gourd/cucumber like vegetable, with slightly pointed ends and round ' lemon pips' sized seeds. It has light green vertical lines on its darker background along its length, botanical name is Tricosanthes dioica and it is a popular vegetable in Eastern and Northern India. This is an easy dish to prepare and goes very well with parathas or as part of an Indian meal. As it is rich in mineral and vitamins and easy to digest, it is often given to people recovering from various illnesses. Serves 4-6, as part of a meal. 1 medium onion, peeled and finely sliced. 2 tablespoon mustard oil (other oils will also do). Place vegetables in a bowl and add garlic, salt and all the spices, except garam masala. Mix well and keep aside. Add the cumin seeds and wait until seeds splutter. Be careful not to let them burn. Add onions and fry until lightly browned. Add the vegetable mix and stir fry for a minute or two. Now lower the heat,cover and cook until the potatoes are cooked, stirring from time to time. If the vegetables are fresh, no extra water needs to be added; otherwise sprinkle some water, to stop it from catching. Sprinkle the garam masala. Raise heat and stir-fry, until all liquid is absorbed and the vegetables look shiny. Turn heat off.